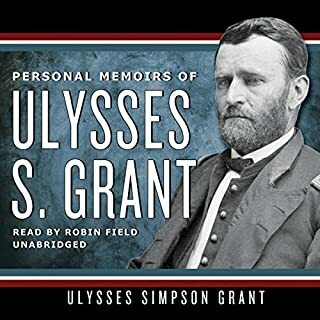 In his own captivating words, General Ulysses S. Grant describes the Wilderness Campaign, the almost anti-climactic surrender of General Robert E. Lee at Appomattox, and the assassination of President Abraham Lincoln. His depiction of the most crucial and hardest-fought battles of the Civil War, the near-disasters, and the bloody triumphs reveals a highly intelligent, profound, thinking man. Grant wrote his memoirs as he lay dying of cancer and completed the manuscript only a week before his death. Of the memoirs of his unlikely friend, Ulysses S. Grant, Mark Twain wrote, "The fact remains and cannot be dislodged that General Grant's book is a great, unique and unapproachable literary masterpiece... [The] style is at least flawless, and no man can improve upon it." Such is the general consensus surrounding this essential American tome, which was finished just days before Grant’s death and focuses on his Civil War years. 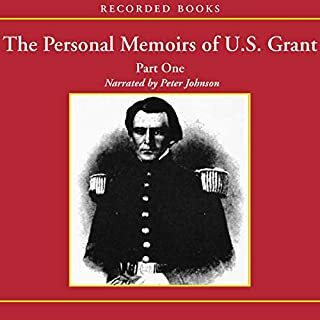 Performed in a mature, elegant voice and without flair by Peter Johnson - himself a Grant scholar, writer, and lauded audiobook performer - these poignant and often sad memoirs are the final exertions of a dying warrior whose hard-won conclusion rings a note of optimism that someday Federals and Confederates may live together in peace. Have we? Covering the pivotal years 1861-1864, General Ulysses S. Grant leads us in his own words from Fort Sumter to his appointment as commander of all the armies of the North. Grant remembers his experiences with the key players of the day, takes us onto the battlefields, and recounts the twists and turns of fate. Grant was a failed peacetime soldier, failed farmer, failed woodcutter, failed bill collector, and 38-year-old clerk in a harness store in the spring of 1861. By 1864, he was directing all the Union forces. Public Domain (P)2010 Recorded Books, Inc.
As a student of the Civil War this was a great read to really get into the mind of Ulysses S. Grant. It is a shame the Grant did not write anymore books in his life, because I felt that he possessed a great writing style. The book follows the chronology of the battles that Grant was directly involved in. I also enjoyed his comments about politics and how he fit in to those politics as the war progressed. 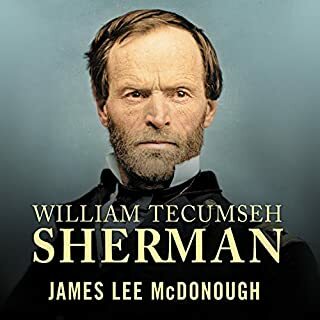 This book would make a great miniseries, to take the script with an actor playing Grant, possibly sitting in a tent or farmhouse, a riverboat outside Vicksburg, and then for maps to be shown of the battles he was engaged in and constructed. If you are going to listen to this book, you will certainly need some maps of the battles, or at least maps of the South to understand the relationships of Vicksburg to Jackson Mississippi as opposed to Richmond and Petersburg, VA. etc. 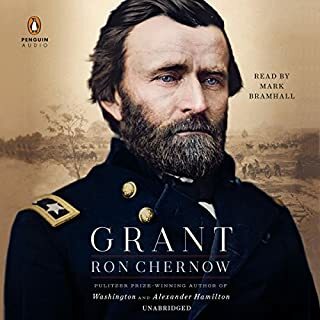 As a young boy in the late 1950's I can remember traveling to Florida and passing through Vicksburg Mississippi, I still have visions of the Vicksburg Battlefield Park; this book helped me to put those visions with a face and a personality to understand the greatness of General U.S. Grant. This is justifiably praised as one of the classics of American literature and one of the best autobiographies ever written, but I found it impossible to listen to because it was so detailed in that I wanted to re-read certain sections and to have a map handy for frequent reference - both quite difficult in this format. A Must-Read for any history buff! Most don't know that this book (aside from the bible) was the most successful book sold in America DURING the 19th century, and that for that entire century, Grant was the most popular American among US citizens hitorically, more than even Abraham Lincoln. This book, more than any other, has taught me to appreciate American History. I own it in hard copy as well, but have listened to the audio version three separate times. Grant has an amazingly easy to follow and interesting reading style. The book being proof-read by Mark Twain himself may have been an assist in that regard ;o). Thanks, Audible. Loved the book! Interesting read for the Civil War buff. The descriptions of battles gets dry at times. You do get a clear sense of how Grant's mind worked and why he did things the way he did. It made me re-evaluate my opinions of some of the Union generals, especially George Thomas, whom Grant characterizes as a procrastinator. Must listening. Well narrated. Insight into the thinking of one of the greatest military minds in history. Very little has changed since the end of the Civil War. It has just become a cold war between the states. It is now a cold war. The details of the battles are difficult to follow without a map. His insights into the social class system of the South and how the common man, who was called "white trash" is penetrating and pertains to this day. He was a modest man, with a brilliant mind. The book is worth reading just to gather his deep insights into the formation and structure of our nation. He could have said the same things about our country to day. Lets see if we can live together. Different races, religions, ethnicities etc. I do not think he would have thought we could, but he would have given it a hell of a try. The mechanics of war from the mouth of Ulysses, nothing could be better. For those who are interested in the Civil War and have been following it for a long time, listening to Mr. Grant talk about the details of that war are very interesting. 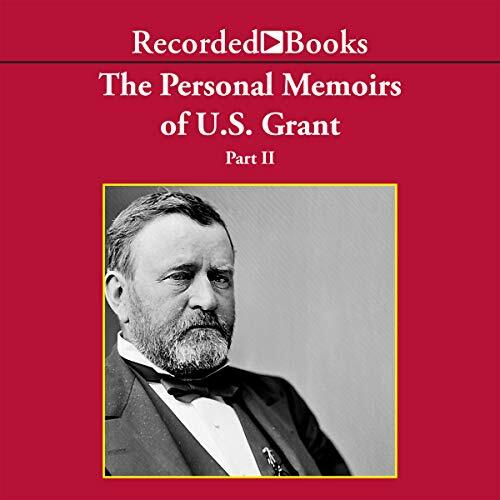 What made the experience of listening to The Personal Memoirs of U.S. Grant, Part 2 the most enjoyable? Yes, who better to write a book about the Civil War than Grant. I Recommend all three volumes of his book. What disappointed you about The Personal Memoirs of U.S. Grant, Part 2? The production of this audio book was poor. There were several chapters that were repeated and likely some that are missing. After hearing the same chapter for the second and sometimes 3rd time, I just skipped to the next one and assume that some whole chapters were missing from the audio book. 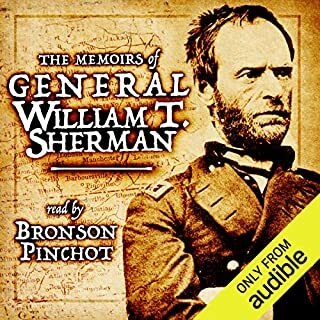 I have since downloaded from Audible another publisher's version Grant's memoirs that was not subdivided into three parts and am fully satisfied with that version. It's a great story and am happy that I can now enjoy it as it was intended. An absolute must read for any civil war buff. Grant is entertaining, straight forward and funny.